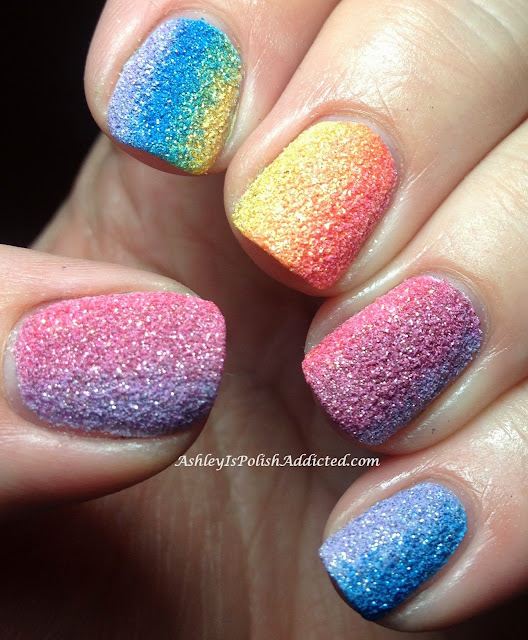 Ashley is PolishAddicted: MANIc Monday With A Tutorial For My Rainbow Gradient (Snow Cone) PixieDust Mani! 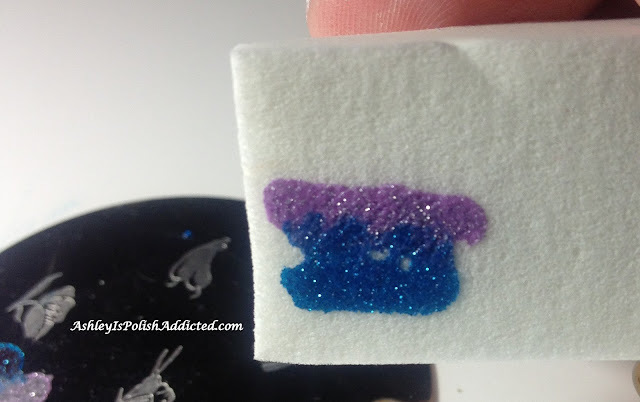 MANIc Monday With A Tutorial For My Rainbow Gradient (Snow Cone) PixieDust Mani! Good evening! 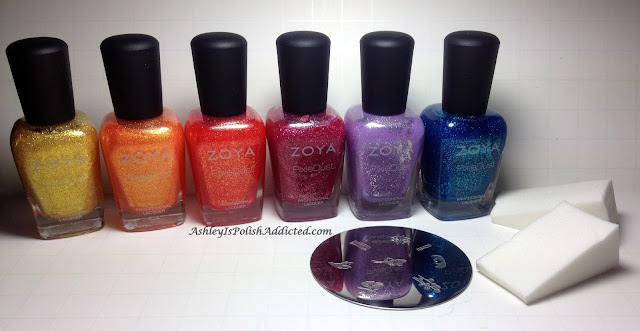 After posting my Zoya PixieDust review and nail art post on Friday (if you missed it you can find it here) I had a lot of people asking for a tutorial on how I achieved the look. So, here is my very first tutorial! Since this is my first I'm just winging it here so if you have any questions feel free to ask in the comments and I will be happy to answer. Now let's get to it, shall we? I called this a "rainbow gradient" in my original post but many people were saying it looked like a snow cone - which it totally does! I don't know why I didn't see it before - my readers are awesome! So now I'm calling it a Rainbow Gradient Snow Cone. 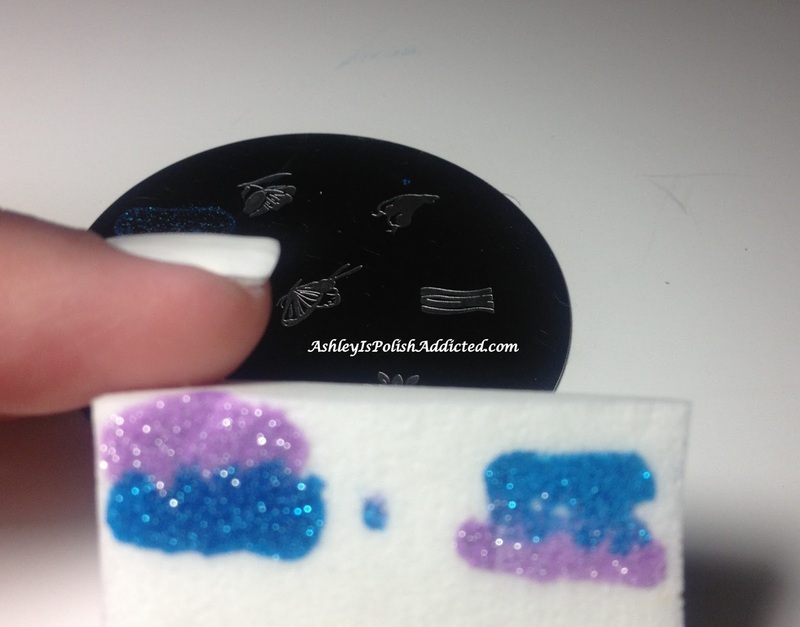 For this look you will need texture polishes (I used all six of the Zoya PixieDust Summer Collection), wedge makeup sponges, a non-porous surface (I used a stamping plate) and a toothpick or needle, etc. I started by painting my nails with a plain white creme. I'm not sure that this was necessary because the polishes were completely opaque by the time I was finished but I do think it might have made them a little brighter. After your base is dry (or your bare nails are dry and free from oils) take the first two colors that you want to use (I only did two colors at a time, even on nails that had three colors) and paint a strip of each color the length of your nail touching each other (as shown below). Now take your toothpick and start gently dragging each color into the other (shown below). I initially tried swirling them but that didn't really work so I did several "lines" that created a similar effect. The goal here is to get rid of the harsh line because you will not be able to do this after you get it on your nail. Next, take your sponge and press it directly on the polish - straight down and back up. The photo below isn't my best attempt but since you are going to be doing more than one layer it doesn't have to be perfect. Take your sponge and press it directly on your nail and back up. No trying to "blend" or move it up and down - this just moves the texture around. As you can see below, I did not get it directly in the center of my nail as I did in my original mani. This can be corrected, if desired, in the following layer(s). Wait a bit for that layer to dry (it doesn't take too long before you can add another layer) and repeat. 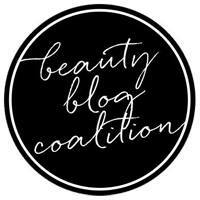 You can do this as many times as you like to achieve your desired look. The photo above (on my pinkie) shows 2 layers using Liberty and Stevie. The photo below is 3 coats of Stevie and Miranda. Continue the process in the order you want. For nails that have three colors I still only used two color at a time - it just worked better that way for me. I didn't think to take photos of the cleanup but I used acetone and an eyeliner brush. It wasn't as bad as I had imagined it being. I hope you enjoyed this tutorial and you are able to re-create this look! If you do, please post a photo on my Facebook page - I would love to see! I kept wanting to ask you about this mani and I forgot - and then you go and make a whole tutorial. You are simply AWESOME!!! Thank you so much!!! I love this mani so much! I now wish I had the whole Pixie Dust collection. Love the mani and the tutorial! That is such a cool idea! 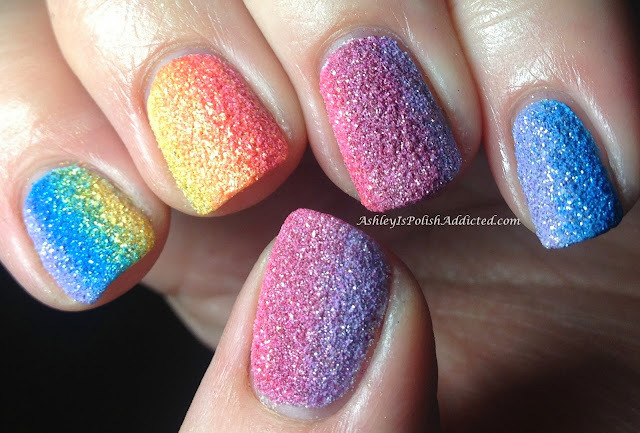 And I love the name Rainbow Gradient Snow Cone! Love this! Are the three middle fingers the ones you used 3 colors each on? Thank you! Yes, the index, middle and ring fingers all have 3 colors on them rather than 2. This is gorgeous. Could you please tell me what order you used the colors in? They look so awesome the way you have done them. I'm not sure if I can get this collection her in Australia, but after seeing this I'm certainoly going to try. Thanks for sharing this tutorial. I'm saving it for future use.